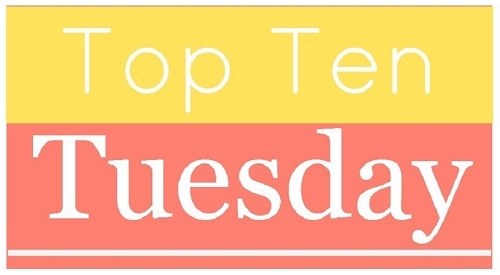 Top Ten Tuesday, as a book-meme, started five years ago. Today’s topic is in honor of that fifth anniversary, and asks us what are our favorites Top Ten Tuesday posts of the last five years. 5. Top Ten Book Club Books: My ideal book club would be very hard to attain, but also a lot of fun to attend! 4. Top Ten Books for Readers who Like Friendships: So few books are centered on friendship. This was a hard topic, but one very dear to me. 3. Top Ten Romance Likes and Dislikes: I enjoyed writing this one up, and got a lot of very positive response to it. 2. Top Ten Tuesday – Thanksgiving Feast: I don’t have a link to this one, because it’s on an old blog, but I created the above picture of the ten authors I’d love to be at my Thanksgiving dinner table. They’d be a fantastic mix all together! Thank you to the bloggers at The Broke and the Bookish for running Top Ten Tuesday all these years! Here’s to many more! Totally agree with you on friendships! Those books are always the best. After looking at your list, I see a couple that I probably need to read from the sounds of it. (The Raven Cycle (series, right?) and The Golem and the Jinni.) They already interested me a little, but knowing they’ve got good friendships in them as really increased my interest. Also, and I’m really hesitant about suggesting this because I don’t know if this is even the kind of book you’d be interested in, but after reading your ‘like/dislikes in romance’ and hearing your thoughts on love triangles, I’m wondering if you’ve ever read The Infernal Devices trilogy by Cassandra Clare. I won’t say it’s obvious at first that the romance is anything more than a typical love triangle, but by the third book it is very different than any other love triangle I’ve come across. (What I think adds to it is the fact that both guys are very close friends, never let the girl come between them and even are both willing to give up on the girl for the sake of her happiness and their friends happiness.) If the series sounds appealing, you might give it a shot because I personally think it is a very well done love triangle. Nice list! A lot of your romance likes/dislikes are very similar to mine, I really want to do that one as a post one day because I have strong opinions as to what I like/dislike in a romance. I haven’t been doing TTT long enough to do this week’s list, so i just picked an old topic instead. That romance post really did get a lot of positive response. It seems a lot of people are tired of certain romantic tropes! Yeah, a lot of them are really overused. Particularly love triangles, if I read another love triangle in a YA book, I may need to scream! I loved your book club post. The book club I was in fizzled out about two years ago so I am not currently in one but I wish I were! I love reading books that I wouldn’t have picked out on my own (in theory anyway, not always in practice). I hope I can get a new book club started up!